A captive insurer (or "captive") is a special-purpose insurance company formed primarily to underwrite the risks of its parent or affiliated groups. It is quite similar to a traditional, commercial insurance company in that it is licensed as an insurance company, it sets its insurance-premium rates for the risks it chooses to underwrite, writes policies for the risks it insures, collects premiums and pays out claims made against those policies. TAKEN CAPTIVE is sure to become the industry’s leading resource for providing basic education and expert guidance on using captive insurance companies in alternative-risk-financing strategies. 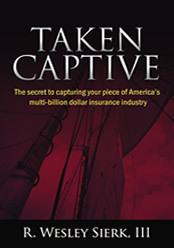 R. Wesley Sierk, III, a trusted insurance-industry expert and president of Risk Management Advisors, provides readers with a step-by-step guide to understanding captives and how they are being used to significantly improve companies’ bottom lines. What are the steps involved with forming a captive? Is a feasibility study necessary? What kind of risks can be underwritten? What’s involved in managing a captive? This invaluable resource should be in the library of every manager responsible for understanding or managing their company’s risk financing strategy!